The final day of shooting a movie or TV show is always emotional, because you're not only leaving a cast and crew that might have become family, but you're also out of a job. That's why many actors want to take a souvenir. The problem is that technically, all the props and costumes belong to the studio, and the studio will often sell or put them into storage to reuse for other productions or let them rot away. Despite that, stealing things from the set has become a time-honored tradition on movies and TV shows, and Star Trek: The Next Generation was no exception. In 2017's Star Trek Las Vegas panel, someone asked the cast if they had ever taken anything from the set on the final day of shooting on "All Good Things." Patrick Stewart, Marina Sirtis, Gates McFadden, Brent Spiner, John DeLancie, and Michael Dorn answered the question and it was hilarious. You won't believe who stole the most stuff. 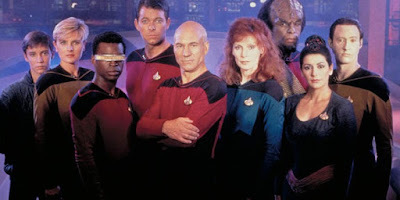 Question: When the TV show ended, did you talk anything from the Next Generation set and do you still have it? And is there anything that you wish you did take? Gates McFadden: I wish I'd taken Patrick's Jaguar. It was in the parking lot and I didn't take it. Marina Sirtis: I took a few things. Brent Spiner: You know, I wanted, when we finished the series, I asked our unit production manager, "Could I have one of my uniforms because--"
Sirtis: That's the problem, you asked. Spiner: I said, "Can I have one of my uniforms." They made 17 for each of us. So I figured sure, they'd let me have one. "No, you can't have it." And I went, "what?" They said, "They don't belong to you. They belong to Paramount Pictures and you can't have one." I said, "All right." So, uh, after the final day of shooting, and we didn't finish on the last shot of the series-- [to Stewart] I don't think you were working on the last day either--"
Patrick Stewart: I certainly was. [laughter] In fact, John, don't you remember? It was John de Lancie and Patrick Stewart's scene that wrapped the series. Stewart: We were still on the set! Working! Sirtis: I thought Jonathan ripped his costume off on the last day. Did he have another one? Gates McFadden: You know, I don't think I was aware of it. I must have thought I'd changed and forgot. Sirtis: You were so tired you'd just forgotten to change. [laughter] I took three costumes. [laughter] I took various other bits and bobs I saw lyin' about. I took my director's chair. You're supposed to take the, uh, you know, the fabric bit on the back, yeah, and it's got the name of the show and then your name on it. I thought, "that's a good height that chair. When I'm gettin' ready for a red carpet event at home, that's the perfect height to get my makeup done, so-- [mimes tucking chair under her arm and walking off] --and I ran into Mary Howard and she was one of our producers and she said, "Where are you going? What are you doing?" I said, "I'm taking my chair." She said, "you can't take the chair." She said, "You can't take the chair, Marina." I said, "I'm taking my chair." What would you have stolen from the set of Star Trek: The Next Generation? A phaser or tricorder would have been neat to keep.